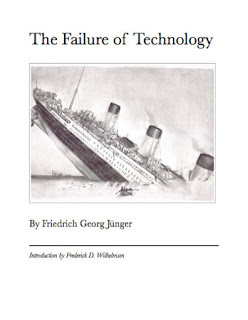 Ernst Jünger - Anarch: FG Jünger's "The Failure of Technology: as ebook! A fantastic recent find, which I trust readers will appreciate and help spread the word - an ebook of this classic and essential critique of modern "scientism" and technology, which has been out-of-print and virtually unfindable in English since the 1960's! It was translated in 1950 from the German original: "Die Perfektion der Technik" - which, btw, in German does not have the positive connotation of perfection in English, but simply implies the bringing to completion, to full development. If you don't know the book, I cannot recommend it too highly! It as insightful as anything his brother Ernst wrote. It contains one of the original environmentalist visions, and its insights into the fundamental shortcomings and illusions of our science and technology have never been surpassed. FGJ gets down to the very heart of the matter, as more recent critiques have not been able to - the superior insight of the author also have been due to his position at a less developed stage of technology, which allowed a more detached, objective perspective. A must read - spread the word and disseminate the book! Funnily enough I just bought a secondhand copy of this yesterday. Don't really regret it though. I am of course happy it's available in electronic format, though the can't fail to appreciate the obvious irony. There's actually another hardcover copy available on Amazon if anyone wants it (it's quite expensive though). I hope that someday soon a helpful publisher will take it on themselves to commission translations of Friedrich Georg's other works. On an unrelated note I wonder if any of his poetry has ever been translated for anthologies of modern German verse? @Daniel: you're lucky to have found an original. Sure, there is irony in an epub of this book - on the other hand, in his brother's book Eumeswil, electronic media is an absolutely essential part of the protagonist's life (ie. the luminar, or "internet"). I haven't heard of any other translations of FGJ's works - and unless something very unexpected happens, I wouldn't expect them anytime soon. He is unfortunately a mostly forgotten poet, even in German. I do have a copy of his "Griechische Goette", which EJ rated the best book of all on this subject, and I concur. If you read German, I highly recommend it! I'm very happy to have found this in EPUB. I have read it previously in a scanned edition, which I believe that I found via this blog. This edition however, will be much easier to read. According to Ernst Jünger's diaries "Strahlungen", the original title of his brother's book was "Die Illusionen der Technik", and he later changed it to "Die Perfektion der Technik". F.G. Jünger argues in his book, that the technicians and politicians promise to use technology for creating a paradise, a world without hunger, fear or slavery. But he says if these are not outright lies, they are illusions. Because the price of technology is much higher than its advantages. Thus, there is a dark irony in Jünger's use of "Perfektion". @anonymous: Thanks for that info - it makes lots of sense, and is important to clear up for English speakers, who may mistake the German "Perfektion" as a positive or approving sense. I suppose the english title "failure of.." was chosen to avoid this error. I am unable to download this publication. Is it still available at the site link? Yes, the Failure of Technology is still available at the 4Shared link given above. Apparently you have to be logged into 4Shared in order to download for free - or create an account with them.